Shreveport is the third-largest city in Louisiana and a crossroad to the South. Bisected by two interstates, 49 to the north and south and 20 to the east and west, the city provides a gateway to Texas, Arkansas, and Mississippi as well as to the state’s larger southern cities. In 1980, according the U.S. Census, the Shreveport population peaked at nearly 207,000 residents. Today, that number is down to 201,000 but is slowly growing. The main employers in the city include Barksdale Air Force Base and several public school and health systems. But to attract jobs, Shreveport has to be a place people want to live. And that’s what ANECA Federal Credit Union ($95.5M, Shreveport, LA) and its CEO, Stephanie Sievers, are trying to make the city. Historically, ANECA’s relationship to its local business scene has been service-industry focused, with investments in restaurants, gyms, and similar projects. Five years ago that started to change. A number of civic and government agencies began forming initiatives to encourage local entrepreneurs and drive money back into the Shreveport economy. Groups like the North Louisiana Economic Partnership formed, and local universities increased community involvement. In 2012, the Film Prize Foundation launched the Louisiana Film Prize, a short narrative film contest with a $50,000 grand prize, the largest cash prize for a short film competition in the United States, and one rule: the film must be shot in the Shreveport-Bossier area. We need to invest in our economy to make this a place where people want to move back home. In 2013, the executive director of the Film Prize Foundation reached out to ANECA for a contribution to a new competition — one called the Louisiana Startup Prize. The Film Prize family has expanded further and now encompasses four different competitions: film, startup, music, and food. If that sounds familiar, it should. The executive director of the prize family is also on the board of South by Southwest, the large Austin, TX,-based film, music, and technology festival. 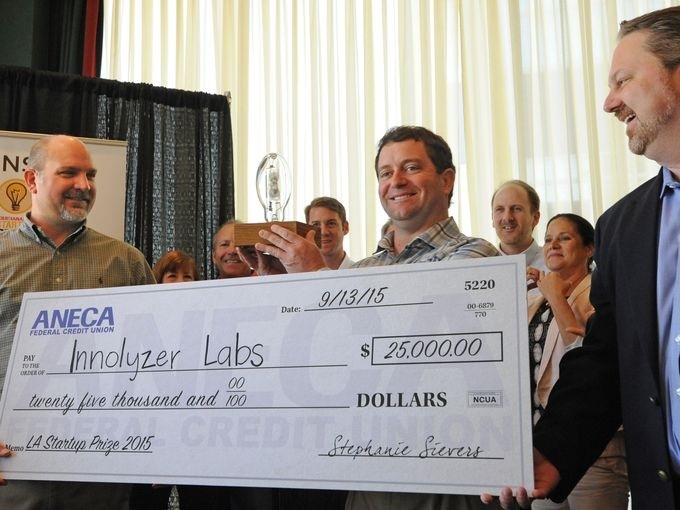 The Louisiana Startup Prize started in 2014. Now in its third year, the prize has given two $80,000 grand prize packages in cash and services and helped 174 startups. ANECA originally donated $25,000 as one of the early sponsors of the event and now contributes both money and knowledge to the startups in the competition. To be eligible for the prize, startups must attend one of two qualifying events held in the late spring and early summer. The qualifying events, which ANECA sends employees to, provide networking opportunities and informational sessions from which startups can learn more about business planning and operational challenges. After a judging process, startups are whittled down to the top five. 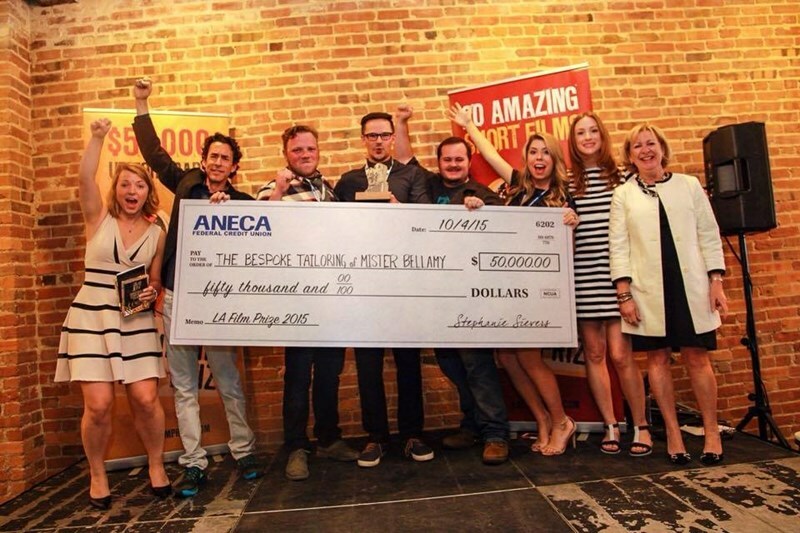 Last year, ANECA awarded these five finalists $100,000 each for business expenses. The top five then present, behind closed doors, to a panel of judges for the grand prize. Sievers herself sits on this panel. Winners of the 2015 LA Startup and Film Prize take home their oversized checks. Photos courtesy of ANECA Federal Credit Union. But even after the grand prize is awarded, ANECA tries to continue its relationships with the competition’s businesses. ANECA helps the young businesses with marketing as well. The credit union allows them to set up a demo or display in one of its branch locations and offers a booth at one of its community events. It will even plug them on social media. ANECA has posted significant growth in its member business loan business as of late. In third quarter 2013, the credit union held $761,000 in MBL balances. At first quarter 2016, that total had reached $5.3 million. In 2015, ANECA hired two business lenders to work in its newly formed business development department. And although they do important work drumming up community awareness, Sievers says all of the credit union’s employees are responsible for maintaining relationships with its members. Beyond member patronage, Sievers sees firsthand how much her staff wants to be involved in the Shreveport community. According to the CEO, food, films, and music are something staff members are already interested in. So when the prize events take place, they know and want to be involved. The fun-loving nature of the Film Prize Foundation is reflected in the personality of ANECA and its 27 employees in ways outside of the Startup Prize. For example, the credit union runs a Lemonade Day in conjunction with the state of Louisiana where kids between the ages of 4 and 18 compete to see who can make the best lemonade stand. It’s a lesson in teaching children how to start, own, and operate a business, Sievers says. All participants receive “startup capital” (powdered lemonade and water) and the winner receives $250. In addition, the credit union has its own rap video and is working on its second. According to Sievers, the videos are a way to bring together employees and members and spread awareness about ANECA. NOw that's a rap, wrap?